Freshman guard D’Angelo Russell has not announced whether or not he will opt out of his remaining collegiate eligibility in favor of the NBA, where he is widely speculated to be a lottery draft pick. When the final buzzer rang Saturday night in Portland, Ore., four Ohio State basketball players walked off the court for the final time as Buckeyes. At least four, I should say. The OSU careers of seniors Sam Thompson, Shannon Scott, Amir Williams and Trey McDonald are over, and their legacy is a question mark — much like the Buckeyes’ future outlook. Despite being part of 109 wins for the Scarlet and Gray, Thompson, Scott, Williams and McDonald never seemed to make their mark. After a Final Four run as freshmen and an Elite Eight finish as sophomores, the quartet failed to fullfil their potential after the departures of Deshaun Thomas and Jared Sullinger. As another offseason begins, the Buckeyes could wonder what might have been if their departing seniors had lived up to the hype, but they might want to refocus on the future instead. In addition to the four seniors, redshirt-senior forward Anthony Lee is done as a collegiate basketball player, leaving OSU five players short. Those holes will be partially filled by the eligibility of soon-to-be redshirt-sophomore center Trevor Thompson and five new recruits, but it’s a potential sixth hole to fill that OSU should worry about most. 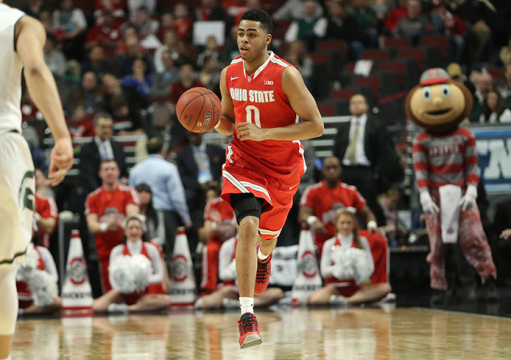 Freshman guard D’Angelo Russell, who shot 3-for-19 in the Buckeyes’ season-ending loss to Arizona in the round of 32, is projected to be a top-five pick in the 2015 NBA Draft. After a season filled with inconsistency, does he have any reason to stay in college? Russell could easily be making his millions and leaving his mark on the NBA next season, but his decision will make or break the 2015-16 Buckeyes. If Russell leaves, OSU will only be returning one player who started a game in the NCAA Tournament. 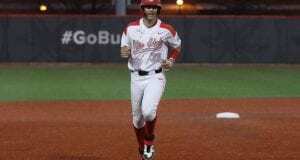 But if the Louisville, Ky., native returns, the Buckeyes could be not only better than this past season, but one of the best teams in the nation. You don’t need senior leadership to win in the NCAA — Kentucky has proven as much this season. And for OSU, which, under coach Thad Matta, typically has experienced upperclassmen, next season could be a turning point. 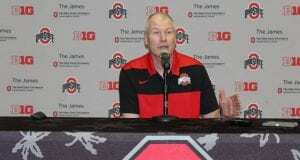 Not only will the Buckeyes be returning just one junior next year, but they’ll have a whopping zero seniors. If Russell stays in the fold, he’ll be teaming up with rising-junior Marc Loving, classmates Jae’Sean Tate and Keita Bates-Diop, Trevor Thompson and five talented incoming freshmen. That grouping could not only be the formula for a deep tournament run — maybe even a national title — but also a turning point in the culture of Matta’s program. Sure he’s had his one-two-or-three and dones, but he’s never built a team out of young talent with limited experience — except, you know, the 2007 Buckeyes who made a run to the NCAA Tournament final. So forget the win numbers for perhaps the most underwhelming senior class in OSU men’s basketball history. Their legacy won’t go down in history, but they might have sparked a hardwood revolution in Columbus. You know, if Russell stays. I’ve followed the team all year and still don’t understand what Russell is even doing here. Is he a “real” student? What is his major? Announcers all talk about him as someone just giving us a helping hand for a year while waiting to go pro. Even when they talk or the press write about him it’s as if they have a set script–that he is a media creation. Watching, it doesn’t seem that he has synergy with the other players or with the fans. He came here because Louisville said he wouldn’t get playing time. Hey I think you forgot one additional current Buckeye BB Player.